Details: Informatica-L is a peer-to-peer resource for technical discussion on Informatica. It helps in analysis and resolving problems related to Informatica quickly and reduces research and development time of a project. 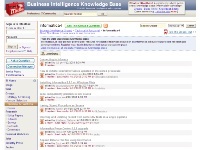 The forum contains many example Informatica solutions and the users often share their experience and best practices. The forum needs registration to write posts.